Refresh and revitalise your skin with Panier des Sens The Essentials Firming Sea Fennel Perfumed Soap, a solid vegetable soap bar infused with an uplifting fragrance. 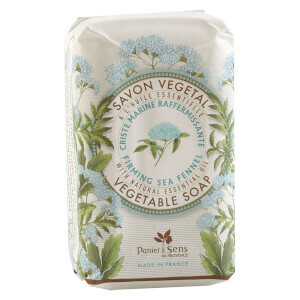 Inspired by the master soap makers of Provence, the formula transforms into a luxurious foam upon contact with water, melting away any impurities whilst using Sea Fennel Mineral Salts to firm and tone the body contours and reduce the appearance of cellulite. Expect fresh, hydrated and silky-smooth results. Free from parabens, aluminium and silicones. Sodium Palmate, Sodium Palm Kernelate, Aqua (Water), Parfum (Fragrance), Palm Kernel Acid, Sodium Chloride, Glycerin, Prunus Amygdalus Dulcis (Sweet Almond) Oil, Tetrasodium Edta, Tetrasodium Etidronate, Rosmarinus Officinalis (Rosemary) Leaf Extract, Helianthus Annuus (Sunflower) Seed Oil.